Just 2.5 miles west on NW 10th street from Garth Brooks Blvd is this one owner exquisite home that is close to town but feels like living in the country. It has a fabulous layout and was built for entertaining. The gourmet kitchen features a Jenn-Air gas cooktop, 2 stairless steel Jenn-Air full size ovens, 2 stainless steel Bosch dishwashers, and GE Monogram 48 inch refrigerator & 48 inch freezer. Also includes opulent granite throughout including an 8x4 solid s!ab island. The spacious master suite features a sitting area, a large bathroom and a substantial closet which ls also a concrete safe room. Upstairs has an incredible theater room with a balcony. The outdoor area has a beautiful pool with a slide and large hot tub. Also included is an outdoor fireplace that is wonderful on those cool chilly nights. The oversized 3 car attached garage includes an electric attic lift. 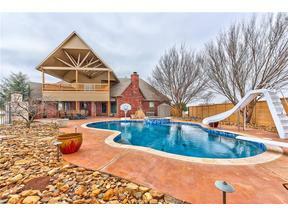 This lovely home sits on nearly 7 acres with a detached 2 car garage/shop. There are gorgeous mature trees.